Short answers to queries relating to wedding photo hints. The right choice is according to your taste. I always ask whether there is a preference for candid or posed. The answer is most often candid but when we go through some albums it is surprising how popular some of the posed shots are. How long does it take to deliver my photo package? The images and small photos are ready within 2 -4 weeks. Albums and canvasses take longer depending on the queue at the printers. Can I have Arty images, i.e. can they be surreal? Yes, but this requires more time which is dictated by the quantity and degree of difficulty. There is going to be a cost but it is great value if this is what you are looking for. How do I ensure all the family/group shots are captured? The optimum shooting time is usually between late afternoon and sunset. This is the mood time of day with colour in the air and no harsh face shadows. Evening and night shooting also produces some interesting opportunities and challenges. After all, photography is just the recording of light. If you have the right gear and know how, you don’t need much light to get some extraordinary effects. Spray tans usually have an orange tinge. This is most noticeable when one person has a natural tan and the other has a spray tan. Yes. We need to know what is expected of each other and what we agreed on. If the scope of the engagement changes then this will be confirmed via email. Yes. A booking fee is required to secure your date and time. Can we have a fancy slideshow of our wedding? You choose the backing track (something that was special on the day perhaps?) and I can blend the best photos into your hi-res Byron Bay wedding slideshow. Your beautiful hi-res wedding slideshow can also be posted on YouTube if you wish to share it with family and friends. A link to a slideshow gives everyone access to wide range of images from go to whoa and puts them right back in the picture (at no cost to you). When links are distributed, these slideshows earn plenty of hits. You can view some samples on this website that will give you a pretty good idea of what to expect. The slideshows are put together using video editing software. It is possible to add video, voice recording, text and other effects to make it more appealing. If you want to select the slideshow images yourself then your Byron Bay wedding slideshow will likely follow on about a week later. Can the images be modified after delivery? Yes but if this is a significant variation to the body of work then there may be an additional charge. Do you supply your own meals? Yes but I won’t say no to a better option if it is offered. This is not compulsory, just a kind gesture for the wedding photo hints. Can I have copies of images in alternative formats, e.g. black and white? Yes you can have images supplied in many different formats such as sepia, pastel, vintage marmalade etc, by prior arrangement. You can share the photos as much as you like but you cannot sell them. I can sell the images and use the images to promote my business. What size can the images be enlarged to? The JPEG images provided can be enlarged to approximately 30cm x 45 cm (12″ x 18″) without loss of quality. If you want to print larger then I will provide hi resolution ‘TIFF’ images that can be enlarged considerably. I also store the original RAW NEF images for you and you are welcome to have a copy anytime. This depends on the season and the day of the week. The peak wedding season around here is Spring with Autumn and Summer running 2nd and 3rd. If you want your photographer of choice then 12 months notice is usually required for the busier seasons from Friday – Sunday. Week days are not as busy so if you are eloping you can be a more spontaneous. 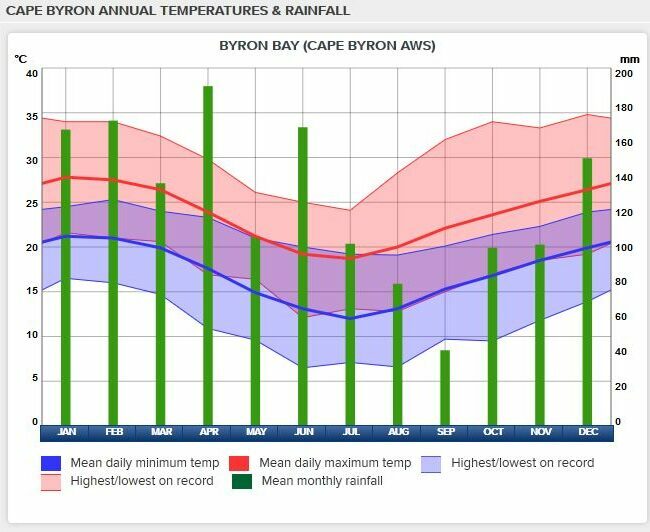 What is the best season to get married around Byron? The busiest season for weddings around Byron Bay is spring. Next is Autumn then Summer and everything quietens down in winter. Outdoor wedding photography is not reliant on any particular season as much as it is on the weather conditions the day of the shoot. The most reliable weather (driest) is July through to December. The low season for accommodation and venue bookings is winter. See the average temperatures, etc below. Winter is not such a bad choice.